Thanksgiving is right around the corner! The blogosphere has been celebrating fall since the end of August so I know you might be tired of it. We bloggers have a way of killing a holiday like the radio kills a good song. But before we break out the Christmas carols and Christmas trees, let’s give Thanksgiving it’s proper due! 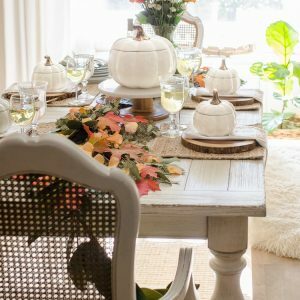 I have rounded up a collection of 16 different Thanksgiving table setting ideas to help us plan ahead. I love the colors and simplicity of the tablescape below. I love artichokes, so I’d like to eat those decorations. This centerpiece would go perfectly with the table setting above. I have used the asparagus trick around a vase before and cinnamon sticks around candles. It is such an easy and simple way to dress up your pillars! This was my tablescape last year just for a simple fall meal, but the idea could be embellished upon for Thanksgiving. I used an old throw as my tablecloth and made some candle cozies to spell the word gather. Lanterns, pine cones, and an all neutral palette looks just dreamy! Tip: Search Hobby Lobby and Ikea for cheap lanterns. The picture below is actually from a wedding reception, but I thought it was a fantastic idea for Thanksgiving. Ribbon I tell ya. It does wonders to dress up just about anything! I like the idea of using family and friends photos in black and white to create a centerpiece. It is a great way to keep the focus of the holiday on those who we are so thankful for. Pears pinned with name tags never get old. This idea has been around for decades and I still love it every time I see it! The table setting below couldn’t be simpler! Place a row of pumpkins, pears, and candles down your runner and you’re done. 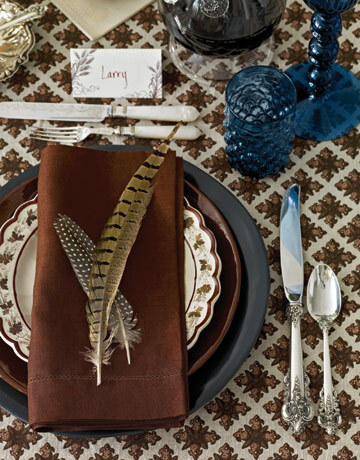 Feathers on the table look fantastic at Thanksgiving! I love the organic touch. Real feathers can get pricey so look for deals on silk feathers at any craft store. I wouldn’t recommend using real feathers. Ew. You don’t want the threat of avian flu threatening your Thanksgiving ;)! 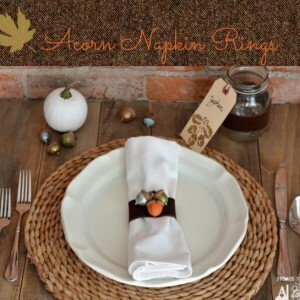 Instead of a pine cone at each place setting, why not use a sweet gum ball? Just don’t put these at the kids’ table. They are too tempting to throw! Sarah’s centerpiece is easy to make and looks gorgeous for everyday use as well. She placed painted pumpkins at each setting which ads charm to the table. I love this trough centerpiece below! Stuffed with gourds, pumpkins, and candles it displays the bounty of Thanksgiving beautifully. The chalkboard table runner is from a catalog, but I think you could DIY something similar without too much effort. What a fun way to set up appetizers or a dessert buffet! This is one of my favorite table settings of the bunch. I love the the coffee filters glued to ribbon on the chair backs. The butcher paper runner is another fantastic idea to steal. And what is simpler than a row of green apples surrounded by gourds? Don’t neglect your kids’ table this year! 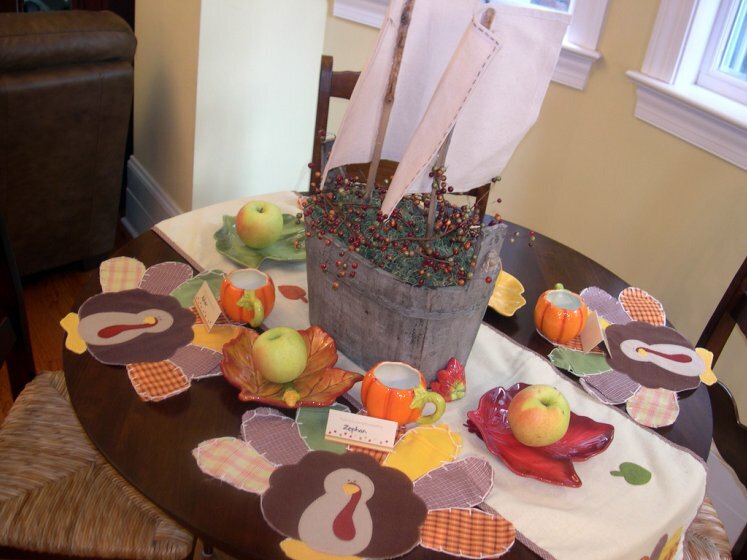 Below is a kids’ Thanksgiving table I did a few years ago just for fun. I made a mayflower from a wooden basket using craft foam, dowel rods, and drop cloth sails. And here is another kids’ table using lots of scrapbook paper goodies. And since I am loving simple this year, I will end with this idea. Pears on top of mini flower pots. Crayons in flower pots. 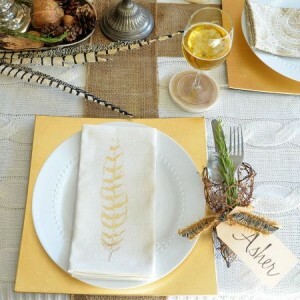 Craft paper with drawn-on place mats and large printed name tags. So cute! So how about you? 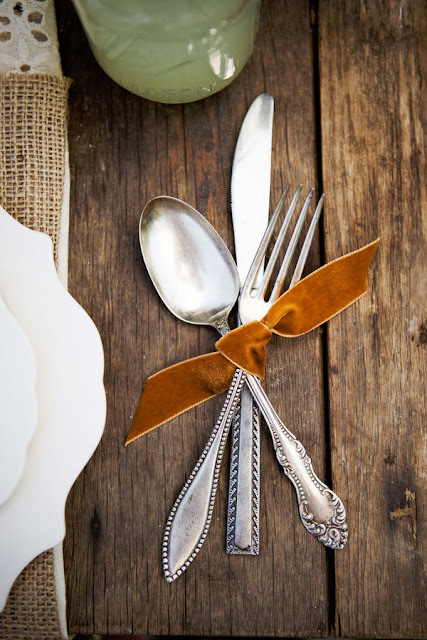 Do you have your Thanksgiving tablescape planned out yet? I’ll be having Thanksgiving at my mom’s house, so I’ll let her plan it for us :). I’m so spoiled! 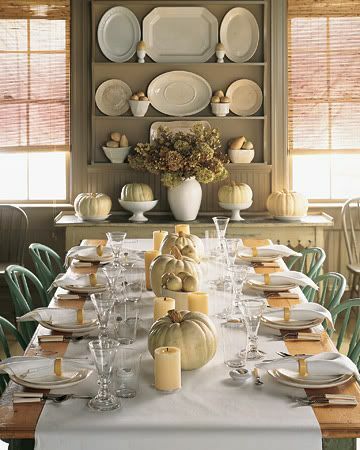 What a wonderful setting of thanksgiving table! 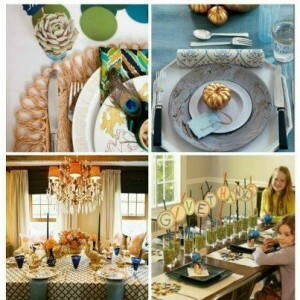 Your thanksgiving table ideas made my heart beat fast!!! These are some really great ideas you have shared here! I like the thanksgiving table setting created by you. I got lots of ideas from your article. Thanks for sharing. to Z” was definitely worth commenting on! Basically needed to state u really did a superb job. Hi Beth, I came across your blog when I had googled “Seasons of Canon Falls” table runner. It was so strange because the first image is actually my breakfast room that I had photographed and had put on the HGTV site. I was honored that you included me in this post. Those kids tables are too too cute! I love the hand drawn placemats!! Great ideas! Just wanted to mention that I bought 6 feet of chalk board contact paper off amazon and used it as a runner for a halloween party. It was only $8 and I thought it looked great!! Pin Pin Pin I love them all! Thanks for posting this today! The closer it gets to Thanksgiving, the less creative I become…I will save this when it comes time to set the tables. Beautiful! Love every one of these tablescapes!!! This is a great round-up of ideas! Love the paper tablecloth in the last photo- fun, easy, simple=perfection! Beautiful to look at but I think some are just to look at and not practical, like the lanterns. Centerpieces need to be low enough for people seated across from one another to see each other & converse. These also must be for families who serve their meals buffet style. In our home we will do place cards and some type of place setting bauble but any space not covered by our individual plates is covered in serving dishes. “Please pass the stuffing!” I love the inspiration for the season but not for an actual meal, however. I found each and every one so very appealing … I’m definitely drawn to the simple, natural & elegant settings. Thanks for the inspiration! Great inspiration! Thanks for compiling these great ideas. I’m always looking for something different different every year. Funny! I’ve had the pic from Seasons of Cannon Falls saved for several years now. These are all so pretty and adorable! I especially love the fork, knife, and spoon bundle (beautiful flatware!) and the gumball as a name card. LOL! I’m crackin’ up at the Avian Flu comment! And I can just see our boys throwing the gum balls! (We’ll save those for the adults). Beth, you’ve really put together a beautiful collection of tablescapes! My artichokes are ready and sitting in my centerpiece….but I’m about to devour them… grilled… with butter and garlic. Great post sista’! I love the last one the most! How fun to write on the table. I think this is great for adults too…Each year, we draw cards at random with a family member’s name on them. We write why we are thankful for that person, back in the hat, then pass them back to the namesake and take turns going around the table reading what someone wrote about us. It’s always fun guessing who wrote for whom. Thanks for that chalkboard buffet idea! I had not seen that one! These are amazing ideas!! 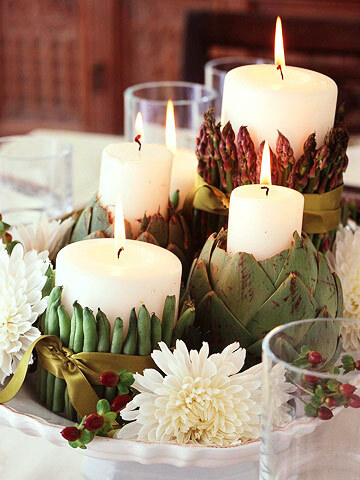 I think my fave has to be the artichoke candle holders, but they are all gorgeous. Thanks for the inspiration, Beth. 🙂 And yes, let’s do give Thanksgiving it’s due! Beth! Thank-you those were all wonderful ideas. I am especially impressed with your own tablescape. I am shocked no one in our own family has avian flu yet. We have so much dead animal stuff around.